Convention Centre Dublin marks a "new era" for conference and events business in Ireland, according to Irish Prime Minister Brian Cowen. 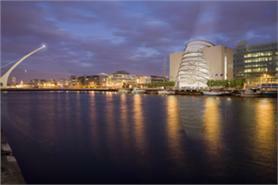 The Convention Centre Dublin (CCD) has opened today after more than three years of development and construction. Ireland’s first purpose-built conference centre has the capacity to host events for up to 8,000 delegates and, to date, has secured 150 events. Irish Prime Minister Brian Cowen said: "The opening of the Convention Centre Dublin marks the beginning of a new era for convention and business tourism in Ireland. Tourism is a vital export industry for Ireland and is an essential part of the Government’s strategy for economic recovery and job creation." While testing the building, the CCD hosted events including X Factor, Britian’s Got Talent and the 175th Anniversary conference for Engineers Ireland. Grass Roots is producing three separate launch events for the centre. Cowen added: "One area of opportunity for us is business tourism and this centre will help Ireland win a greater share of this lucrative market, which, despite the international downturn, continues to provide high-value visitors. All ministers and state agencies will be working hard to identify international events which we can attract here." CCD chairman Dermod Dwyer said: "This iconic landmark will allow us to demonstrate new international standards of hospitality coupled with the renowned Irish welcome. I am confident we are on track to reach our goal of being recognised as the best conference centre in Europe by 2014."